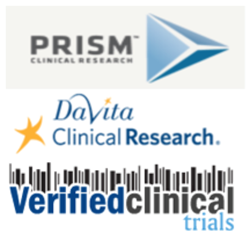 DaVita Clinical Research (DCR), a specialty contract research organization with services spanning the full spectrum of drug and device development, and Prism Clinical Research, a leader in providing fully integrated clinical research services to pharma/device companies and clinicians, today announced Verified Clinical Trials (VCT) has been selected by both companies as an exclusive provider to further prevent duplicate enrollment in clinical trials. Simultaneously enrolling in multiple clinical trials, or duplicate enrollment, has become a serious problem in the clinical research world. A growing number of research volunteers attempt to jump from one study to another without waiting for the appropriate amount of time to lapse. This creates dangerous issues for the drug manufacturer, the research site, the data quality, and, most importantly, the volunteer. VCT maintains a global clinical trial research subject database registry to counter attempts at duplicate enrollment in clinical trial research. The majority of phase I units and an increasingly large number of late phase sites in North America use Verified Clinical Trials, making VCT by far the largest North American clinical research subject database registry in both early and late phase clinical trials. Experts and leaders in the field of hepato-renal clinical trials, Prism and DCR join a vast network of research sites and pharmaceutical companies in their efforts to prevent duplicate enrollment and other important protocol violations in clinical trials. Located in close proximity to the Minneapolis and St. Paul metropolitan area, Prism and DCR specialize in early phase clinical research in healthy volunteer trials and many patient-based volunteer trials, including those in hepatic and renal insufficiency populations. Prism Clinical Research is a Twin Cities–based clinical research company committed to the advancement of improved medical knowledge and the community’s health. Since 2005, Prism has provided FDA-approved, investigational pharmaceutical and medical device testing services on behalf of drug and device manufacturers, academic and private physicians, as well as other researchers across Minnesota. DaVita Clinical Research (DCR), a wholly owned subsidiary of DaVita Inc., uses its extensive, applied database and real-world healthcare experience to assist pharmaceutical and medical device companies in the design, recruitment and completion of retrospective, prospective and pragmatic clinical trials. DCR’s scientific and clinical expertise spans the lifecycle of product development with more than 175 client companies. DCR’s Early Clinical Research unit (Phase I-IIa) and Late Phase Clinical Research (Phase IIb through post-marketing) network of physicians and investigative sites, and Real World Healthcare Data are focused on providing world-class research in both complex/specialty populations and therapeutic areas, and especially in CKD and ESRD populations. To learn more about DCR, visit http://www.davitaclinicalresearch.com. Verified Clinical Trials is a forward thinking company developed by experts active in the clinical research community to proactively improve research subject safety and data quality in clinical research trials. Verified Clinical Trials halts duplicate enrollment in clinical trials and defines itself as the world’s leader in the field of database registries in clinical trial research. Verified Clinical Trials is the only clinical research database registry designed specifically to enhance the quality of both early and late phase trials, and has the scalability to reach all sites nationally as well as on a global level. Verified Clinical Trials offers numerous other value-added services to the clinical research site, CRO, and Pharmaceutical Sponsor that prove invaluable with regards to financial and legal issues and liabilities. Verified Clinical Trials prevents several other key protocol deviations. For more information, RSVP to or visit http://www.verifiedclinicaltrials.com.